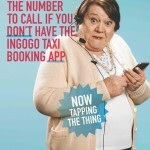 Sydney, 20 July 2015: Leading taxi services and mobile payments provider ingogo has rolled out its first ever consumer advertising campaign – encouraging more Australians to use the latest technology to book a cab. The targeted campaign has run across outdoor, digital and radio in Sydney, and involves a satire promotion of a 1300 INGOGO hotline, paradoxically the number not to call if you want to book a taxi. The campaign was developed by creative agency Special Group, with Match Media as the media agency and Launch Group supporting on PR and communications. It initially focused on the Sydney metro region and aimed to encourage the 88% of Sydney-siders who still don’t use taxi apps, to switch over to ingogo for a faster, more convenient and better taxi ride. The creative for the campaign ran on billboards and digital signage in high traffic density locations and featured some of Australia’s most talented elderly models. The use of quirky imagery was paired with firmly tongue-in-cheek audio, including spots on KIISFM and an actual 1300 INGOGO number that takes callers through a labyrinth of voice messages advising callers to download the ingogo app and book their cab. Jeff Lim, CMO at ingogo, said: “As our first ever major advertising initiative, we wanted a campaign that cuts through the noise and introduced our brand to Sydney consumers – and one that also reflected our values as a high-growth tech player, disrupting a major industry. One of the major hurdles is the adoption of technology by consumers that might not be as tech savvy, and we wanted to get their attention, and educate them. It’s a cheeky nod towards those who are still using old school methods to book a taxi by calling up over the phone. “So far, we’ve been delighted with the reception to the campaign. Its unique approach and use of humour is helping to drive downloads and engagement with the ingogo app,” he said. Complementing the campaign, a series of videos explaining the ingogo taxi booking app’s features have also been created. These videos take pride of place on the ingogo website, and are also being transmitted via ingogo social platforms such as Facebook and Twitter. The campaign is currently in market and will run until August. ingogo is an integrated mobile payments company, currently in the Taxi and SME markets in Australia. Its mobile app assists private and corporate customers to easily book and pay for taxis through their mobile phones. It allows passengers to communicate directly with registered taxi drivers in their local area, see where their driver is and their estimated arrival time, with the option to pay using ingogo's secure in-taxi payment terminals or virtual mobile accounts. It currently operates in Sydney and Melbourne, and has recently launched in Brisbane, Perth and Adelaide.